It’s been barely a day since the Giants made their roster cuts but things are still fluid as they can still add and subtract players on the newly minted 53 man roster. In fact, the Giants released defensive tackle Montori Hughes who made it to the 53 man roster announced yesterday afternoon to make room for DT Robert Thomas. The Giants claimed Thomas off waivers from the Carolina Panthers today. There are still more possible changes in store. Below is the list of the recently announced 10 man Practice Squad. WR Geremy Davis: Davis was a 6th round pick out of Connecticut in 2015 and performed well through training camp but was hampered by a hamstring injury recently. He missed out on reps which Tavarres King and Roger Lewis Jr. made the most of. After going unclaimed on waivers the Giants made the decision it was worth keeping him. Perhaps while on the practice squad his game will continue to develop. WR Darius Powe: Powe is big receiver ( 6’3″, 220 ) who signed with the Giants as an undrafted free agent out of California. He didn’t get that many opportunities during the preseason but he’s got a very good upside. He’s got size and speed and is a developmental prospect. QB Logan Thomas: He was originally drafted in the 4th Round by the Arizona Cardinals and was on the Miami Dolphins practice squad last season. The Giants will be his third organization in three seasons. He’s a physical specimen at 6’6″, 248 but he played poorly for most of the preseason. 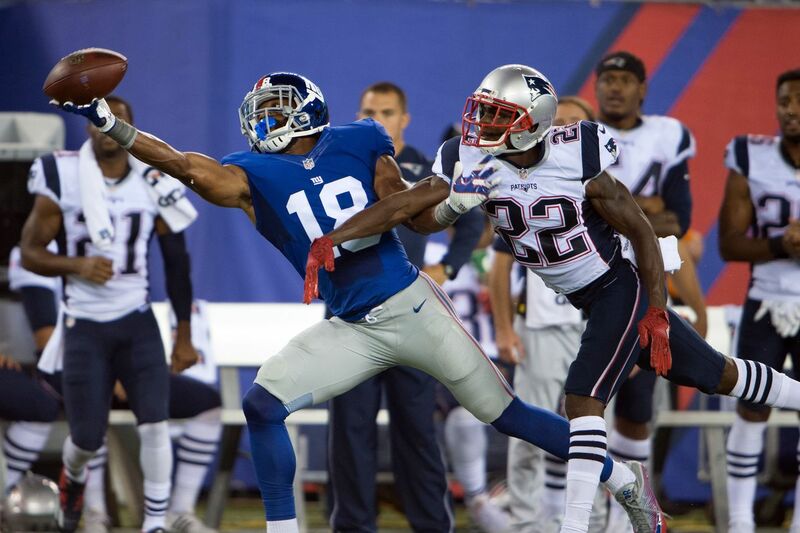 He finished strong with a touchdown drive against the New England Patriots in the final preseason game. His major issue is his accuracy as a passer. OL Adam Gettis: He was on the Giants practice squad roster last season, finishing up on their active roster. He was originally drafted in the 5th round of the 2012 draft by the Washington Redskins. During the preseason games he took snaps at the Guard and Center positions. He started off slow against the Dolphins in the first preseason game but improved as time went on. OL Shane McDermott: He was waived by the Giants in their first set of roster cuts on August 30th but his versatility as a player has returned him to the practice squad. McDermott was on the Giants practice squad last season as well. He can play guard or center. McDermott was originally signed out of Miami as an undrafted rookie free agent by the Dallas Cowboys following the 2015 draft. S Andrew Adams: He played well during training camp and the preseason and slowly moved up the depth chart past fellow safeties Bennett Jackson and Cooper Taylor. He was undrafted out of Connecticut but his strong play led to a productive showing during the summer. CB Michael Hunter: He’s an undrafted rookie free agent out of Oklahoma State, who showed improvement throughout the summer. He’s got a nice combination of size and speed. CB Donte Deayon: The undersized (5’9″, 158 ) cornerback showed great tenacity and effort throughout the summer. He’s small in stature but has got speed and excellent leaping ability. LB Ishaq Williams: He was out of football for two years after being implicated in an academic dishonesty scandal at Notre Dame in 2013. He impressed during mini-camp and was signed by the Giants in May. In limited time he’s shown some raw talent and ability that with time on the practice squad could be developed. DE Stansley Maponga: He was originally a 5th round pick by the Atlanta Falcons in 2013 out of Texas Christian University. Maponga was waived before the start of the 2015 season by the Falcons and claimed off waivers by the Giants in December of 2015. He has played well when given the opportunity this summer and will provide the team with depth at the defensive end position.